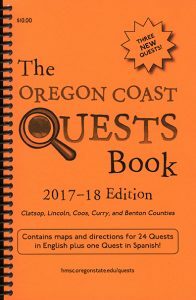 The 2017-18 edition of Oregon Sea Grant’s popular “Oregon Coast Quests Book” is now available, featuring 24 Quests in English (three of which are brand new) and one in Spanish. The directions for virtually all of the previous Quests included in the new edition have been updated to reflect changes in site terrain, landmarks, signage and other details, making this book a must-have for avid Questers! The price for the 222-page book is just $10, and you can buy copies from the retailers listed here. Quests are fun and educational clue-directed hunts that encourage exploration of natural areas. In this self-guided activity, Questers follow a map and find a series of clues to reach a hidden box. The box contains a small guest book, a stamp pad, a unique rubber stamp and additional information about the Quest site. Participants sign the guest book to record their find, and make an imprint of the Quest Box stamp in the back of their clue book as proof of accomplishment. Then the box is re-hidden for the next person to find. The location of the clues and box remain a secret so others can share the fun. Oregon Coast Quest clues and boxes stay in place year-round. 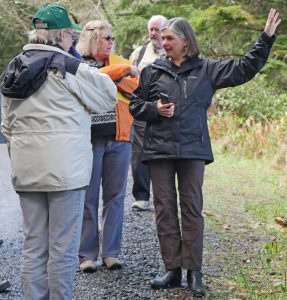 Questing is an ideal place-based activity for individuals, small groups and families. By turning a walk into a treasure hunt, children often race ahead of their parents instead of lagging behind. Through Quests, important areas of natural, cultural and/or historical significance are shared. Furthermore, both those who go on Quests and those who create Quests for others gain pride and a sense of stewardship for their community’s special places. 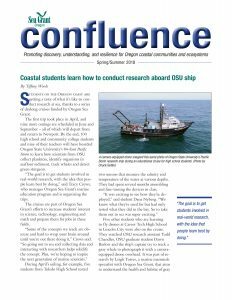 Production of the Oregon Coast Quests Book 2017-18 was coordinated by Cait Goodwin of Oregon Sea Grant. 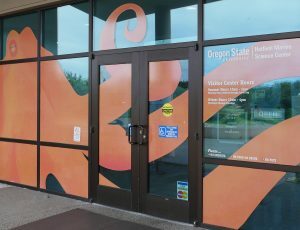 NEWPORT – The Visitor Center at OSU’s Hatfield Marine Science Center is looking for a new giant Pacific Octopus to occupy its central public tank, empty since the demise of its previous octopus, Patriot, a few months ago. 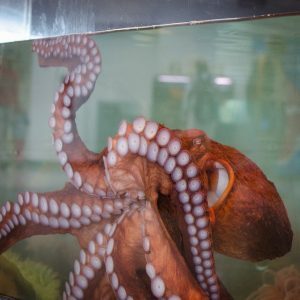 The octopus tank is one of the center’s most popular exhibits, and helps teach thousands of visitors young and old about cephalopod behavior and biology during three-times-a-week public feedings. It’s also the star of the OctoCam, a live, streaming, 24-hour Web cam that gives Internet users a glimpse of how the animals live in a simulated ocean environment. The center’s animal husbandry staff typically receive young octopuses as donations from commercial or recreational fishermen who bring the curious, intelligent animals up in crab pots and other fishing gear, but none have been offered, so aquarists are trying to get the word out. 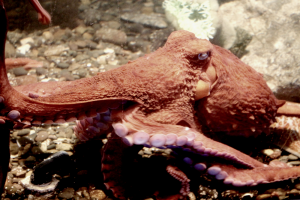 Donors get to choose the new octopus’s name, and know that they are helping teach the public about marine animals and conservation. For more information, or to donate an octopus, call (541) 867-0215 or (410) 991-9753. The HMSC Visitor Center is open from 10 am to 5 p.m. daily through Labor Day weekend. Admission is by donation. The book retails for $10 and is being sold by booksellers around the state. To find out where you can buy a copy, visit the booksellers page on the Quests website: http://hmsc.oregonstate.edu/quests. 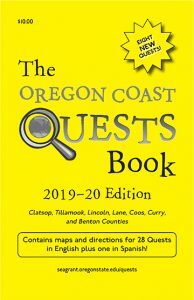 If you happen to be or know of a bookseller interested in selling Quest books, please contact OregonCoastQuests@oregonstate.edu for ordering information. 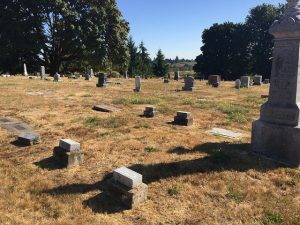 PORTLAND (StreetRoots News) – Nobody’s quite sure why, but toward the end of middle school students lose interest in science and math. Researchers at one Portland school want to learn why. By solving the mystery, they hope to reverse the trend.